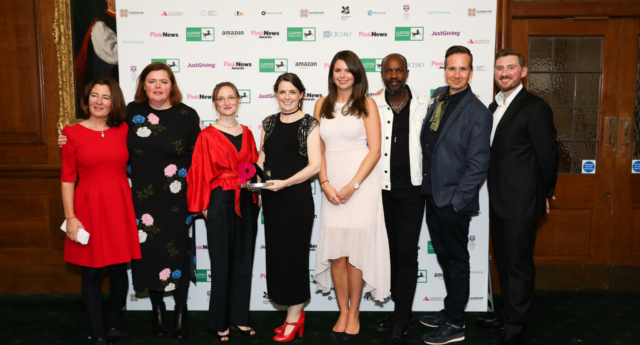 The National Trust was awarded the Third Sector Equality award, supported by Amazon, at the PinkNews Awards 2018. Ben Farmer, head of HR (UK) at Amazon and Baroness Williams of Trafford, Parliamentary Under Secretary of State (Minister for Equalities) and a Conservative life peer, handed the award to a group of representatives from the organisation, including visitor experience director Tony Berry, producer Lucy Footer and curator of the women and power programme Rachel Lennon. The National Trust promised that the organisation will keep working towards acknowledging LGBT+ history and heritage. “Our generation isn’t the first and our generation isn’t alone,” Lennon said. The award ceremony, which recognises achievements and support for LGBT+ rights across a wide range of sectors and activities, took place on Wednesday (October 17) for the sixth consecutive year and was held at Church House in London. Politicians such as Home Secretary Sajid Javid, Labour leader Jeremy Corbyn and former Prime Minister Tony Blair all presented awards at the ceremony, which was also attended by personalities such as broadcaster Victoria Derbyshire, performers Will Young and SuRie, and the star of Channel 4’s series Humans Emily Berrington. The National Trust won the Third Sector Equality award for leading the efforts in highlighting LGBT+ heritage across the country and further afield. In May, the organisation held an international conference in Birmingham to explore how heritage organisations can meaningfully engage diverse audiences in debates around LGBT+ history and culture. Also nominated for the award were: human rights group Amnesty International, for its ongoing support for LGBT+ rights across the world as well as specifically supporting intersex and trans campaigns in the UK and in Europe; homeless charity St. Mungo’s, for its commitment to diverse recruitment and one of its core competencies for all new postings is to actively promote inclusion; and the charity Victim Support, which is dedicated to helping victims of crime and traumatic incidents and promotes events around LGBT History Month, Pride, International Day Against Homophobic Bullying and Trans Day of Remembrance. Last year, Barnardo’s took home the Award. The children’s charity backed marriage equality in Northern Ireland earlier this year.